George Orwell crafted an amazing book that mustn't be missed. Along with 1984, Orwell manages to expose the true meaning of Stalinism, his works deserving to be thought in every school in every country that pretends to be liberal and democratic. 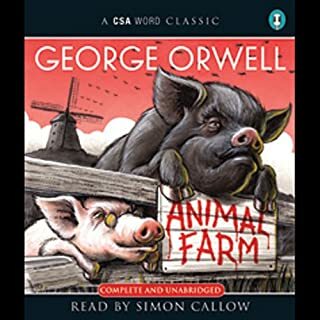 Also, the narration by Simon Callow is beyond any expectations, managing to deliver the strong moments of the book using the funny voices of the animals, expanding upon the already well written personalities of the characters in this book. All in all, I consider this book a must-listen for everyone in love with history and politics.